Although we originally though Nintendo might return with a press conference this year, the charming game company followed form and released a 30 minute long video presentation for E3 2017. Like most Nintendo Direct videos, there was a lot of information packed into the short time frame. From new game announcements to fan favorite returns, Nintendo had a bit of everything this year. Let’s see what they had in store. A story about friendship, adventure, and a heck of a lot of role playing goodness, XenoBlade Chronicles 2 looks like it’ll be making a splash when it launched Holiday 2017. Following the young boy Rex, the story of Chronicles 2 sees him pairing up with the mysterious Pyra. Searching for her home planet of Elysium, the two take on a journey that will be equally parts exciting and enthralling. Check out the trailer below. Nintendo also utilized E3 2017 to reinforce their core franchises on the Switch. Although we won’t be seeing the actual games release for some time, we got a look at more than one fan favorite return. Of those returns, I’m especially excited for the fluffy pink character we all love. Kirby will be releasing in 2018, and while not much is known about the plot, it looks to resemble classic Kirby action. With co-op play and bright colors, Kirby is looking to recreate the magic that made the series so popular. Yoshi has been a sideline character for a while now, despite having several games with him at the forefront. While games like Yoshi’s Island had their own unique play mechanic, a lot of Yoshi-centric games just played like a mash up of Kirby and sidescrolling Mario titles. The 2018 release Yoshi looks to mix that up, providing a unique art style for the franchise as well as key gameplay mechanics. Taking place in a world that looks like a pop-up diaorama, the game evokes the sense of childlike glee that was apparent in Yoshi’s Wooly World. If 2018’s Yoshi can replicate Wooly World’s excellent, I’m on board. Although previously announced in a Pokemon themed Nintendo Direct a few weeks back, Pokken Tournament DX saw some love at E3 2017. The updated version of the Wii U fighting game based on the Pokemon franchise sees a return on the Switch, this time with five new characters. We had a good time playing the original Pokken Tournament, and although not too much has changed, we’re sure you’ll have a good time on Switch as well. Pokken Tournament DX releases on the Switch on September 22nd, 2017. Nintendo also announced that a Pokemon game was in development for Switch, and will play like the other core games in the series. We don’t know anything else about it, including whether or not it’ll see a 3DS release as well. We eagerly await more information. Pulling a note out of Sony’s handbook, Nintendo also announced development of Metroid Prime 4, a game that fans have been asking for since the original trilogy wrapped up back on the Wii. In a true tease, Nintendo unveiled the logo in a brief trailer that contained no gameplay. No word on release window, gameplay style, or story. We just know it exists. However, Nintendo made a huge splash as Metroid Prime 4 was generating a lot of buzz. In fact, some consider the announcement the highlight of the entire show. This game was also briefly announced back in January, but E3 2017 gave us a good look at it. Substituting the more standard turn based approach for tons of hack and slash combat, fans of the series can look forward to causing mass chaos with their favorite characters. The title will also be releasing for the 3DS, but judging by how Hyrule Warriors performed, I’d hold off until the game has released. I’m sure it’ll be great on console though, we’ll just have to see if it’ll run properly on handheld. The game should be releasing in Fall 2017. I’ll be honest, when I first heard about this cross over, I laughed. It’s not that Ubisoft’s Rabbids franchise isn’t entertaining, rather that one would consider Mario and Rabbid on the same level of quality. However, I’ll fully admit that I was wrong, as Mario + Rabbids looks like a great time. With a focus on XCOM-like gameplay, the Italian plumber and his furry pals will be landing on Switch on August 22nd, 2017. If there was anything more exceptional than Metroid Prime 4‘s announcement, it was just how dang good Super Mario Odyssey looks. Nintendo ended their presentation with a new trailer for the game, which then led into their after show where they played a bit of the game live. I have steered clear of anything besides trailers, because much like Legend of Zelda: Breath of the Wild last year, I don’t want to spoil myself on the surprises. 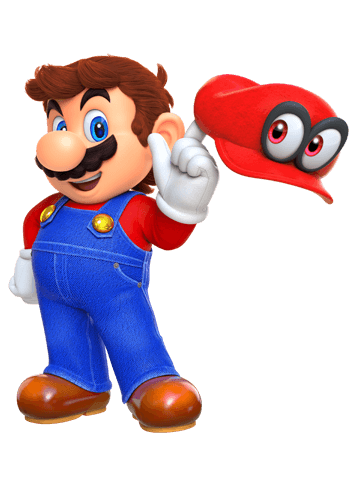 The big feature of Super Mario Odyssey seems to be Mario’s hat, which is an entity all on its own. The hat can be used as a projectile, to collect powerups, and even control enemies. The levels look massive, the colors amazing, and there’s a signature “Nintendo polish” to the entire game. I can’t wait to play it when it releases on October 27th, 2017. That’s all for the Nintendo Direct E3! There were some additional announcements over the course of the week, but we’ll cover those separately as information becomes readily available. Generally speaking, it’s a good year to be a gamer, and a great year to be a Nintendo fan. If you don’t have your hands on a Switch now, you’ll probably want to grab one this summer. Trust me, they’re going to be a hot ticket item again this Holiday, especially with a new Mario title.